The Lexus GS has graced the pages of Green Car Guide for a number of years, but thanks to the performance hybrid approach Lexus has never truly explored the fuel consumption potential of the system, preferring to benchmark fuel economy against petrol rivals and turn the wick up than chase after diesel figures and dilute the performance. That is until now. The 300h has very clearly been designed to take the fight to diesel rivals with fuel economy, performance and price all mimicking the front-running German offerings. Lexus has long claimed that its petrol/electric hybrid system can do everything that a diesel can, and the repost has been ‘prove it’. It appears that it does pay to be careful what you wish for, as on paper the 300h is up to the task and most surprisingly this includes the list price. To extract better fuel economy there have been some big mechanical changes. Out goes the 3.5 litre petrol engine and in comes a 2.5 direct injection unit which produces a restrained 178 bhp. This is supplemented by a detuned electric motor which produces an additional 140 bhp providing a very favourable total system output of 220 bhp. Drive is still transmitted to the rear wheels through a CVT gearbox which as ever is great for fuel economy and frustrating if you are pressing on. 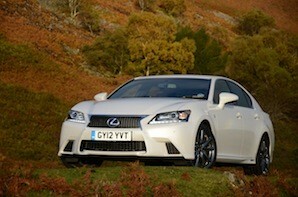 So the Lexus can beat diesel rivals for pure grunt but what about torque? The petrol engine can’t get close, with 163 lb ft at a lofty 4200 – 5400 rpm it won’t see which way the competition went. But as ever with hybrids, that’s only half the story. The electric motor comes to the rescue once more, with a handy 221 lb ft available from idle it fills in the gaps excellently and keeps the GS 300h in the race. The GS remains exquisitely finished and arguably is better suited to the lower output system as it is competent to drive rather than razor sharp. The 300h is no more expensive than diesel rivals, has competitive fuel economy and thanks to petrol emitting less CO2 than diesel, falls into VED band B and attracts substantially lower company car tax. It also has the advantage of emitting no PM and very little NOx for which diesel rivals need to resort to expensive exhaust after-treatment. The GS still isn’t perfect but the 300h is a good enough package to make you think twice before ordering a diesel rival. It seems that Lexus wasn’t joking after all, petrol hybrids really can take on diesels at their own game.